Sandwiched amongst the zombies and guns of the Sony E3 2014 press briefing was a little boy and three of his new friends. Sumo Digital announced Little Big Planet 3. They are new to the series as the previous two were developed by Media Molecule. The latest installment in the 2D side-scrolling series has the hero, Sackboy, joined by three other cute characters: Oddsock, Toggle, and Swoop. On stage, players demonstrated as Oddsock sped around and wall jumped, Toggle used his weight and shape-shifting to move blocks and fit through tiny spaces, and Swoop flew around the screen and carried the others to safety. Not to be outdone, Sackboy has returned with a new air gun to blow obstacles out of the way. The game uses the same hand-crafted art style we’ve seen in previous installments, made even more beautiful by the PS4’s hardware. However, the controls seemed off and the stage participants had trouble getting the characters to behave as scripted. This is an early demo and certainly Media Molecule will work on the controls, but considering LBP’s history of loose controls it doesn’t bode well. One unexpected and welcome announcement was that Little Big Planet 3 will be backwards compatible with all user generated levels from LBP1 and 2 and will be playable in the updated graphics. Overall, it was a strong showing from a much-beloved franchise. The new heroes of Little Big Planet 3! 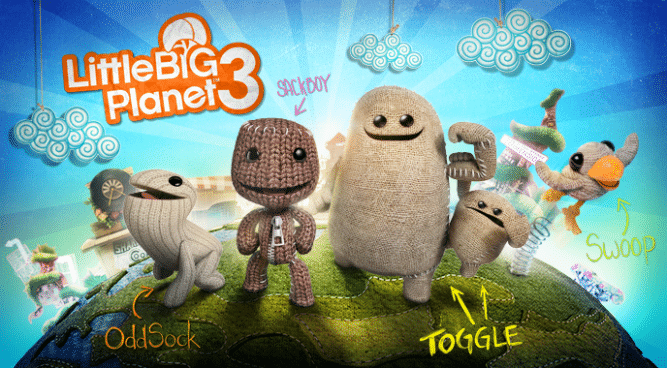 Oddsock, Sackboy, Toggle, and Swoop from left to right. 5 Things We Learned from the Nintendo E3 2014 Online Event! Sony Announces PlayStation TV and the Beta for PlayStation Now!